The Mille Miglia, which closed in 1957 due to the 56 lives claimed in its 30 year run, would once again reopen in 1977 under the banner of The Mille Migila Storica to the cheers of classic car fans. 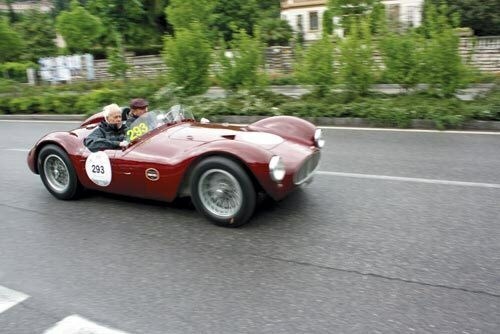 Now 90 years on, the race is much safer and prefers to keep to tradition, only allowing participants to race in cars used in the Mille Miglia’s original stint between 1927 and 1957. Following in the footsteps of nearly 40 years of classic heritage, the 2016 Mille Miglia Storica delivered excitement and adrenaline as the first place Italian duo Andrea Vesco and Andrea Guerini raced to the Brescia-bound finish line in their 1931 Alfa Romeo 6C 1750 GS. "After placing second in the previous race, this year we succeeded in obtaining a victory," commented Guerini and Vesco on the win. Just behind the Italian duo, in second place was Luca Patron and Elena Scaramuzzi in their 1926 O.M. 665 Superba Sport 2000 CC, slightly behind whom were Giordano Mozzi and Stefania Biacca in a 1933 Alfa Romeo 6C 1500 Gran Sport. After these top contenders came 450 other classic cars from over 70 brands, also racing for the ultimate honour of first place. The route which was slightly different and longer than years before - at 1,718km - took these 450 cars from Brescia to Rimini on the first day, then from Rimini to Rome on the second, Rome to Parma on the third and finished the loop on the fourth day from Parma to Brescia. Included in the hundreds of participants were the all-female "special" category racers, of which Silvia Marini and Saskia Stoeckkelmann took first in a 1936 Riley 12/4 Sprite. More than its predecessor, the four day long Mille Miglia Storica has become a testament to endurance, strength of will and an appreciation of classic cars.